Are You Feeding the Trolls? I set the timer on my phone for two minutes and I started scrolling through my facebook social media feed. Before the little bell rang I had counted 23 memes (memes are little pictures with words on them, used to easily express and validate an opinion). Some were funny but some were gross and politically divisive. Despite these being a bad idea to share in so many ways, there is also something even more disgusting than the memes themselves that you are feeding into. By sharing these you are feeding internet trolls. People whose sole purpose is to spread hate and division on the internet. They are the bullies of the internet and have caused real harm and pain on and offline. I could stop there and you could just take my word for it, but I am going to help you identify troll accounts on your own. To show a classic troll profile I am going to use a meme I saw spread like wildfire during the 2016 election. I saw this one everywhere. I even pointed out this piece of fake content in an earlier blog post of mine. I call this one Hillary Screams at the Heartland. When people saw this they instantly clicked the share button. It didn't matter if the facts were true or not. As you can see, 20,000+ people shared it and had no qualms about doing so either. And just imagine how many people saw it in their feed. I bet you might even recognize it. Take a closer look at her description and the comments. When you click in to see the description, you can see that the creator takes full responsibility for creating it, acknowledges that it went viral (oh what a thrill for a troll), and lists multiple sources of where they supposedly got the information. But they never give you the link so you can actually look up the source yourself (because they know you won't and that you will share it anyways). You can also see that this original image is a catalyst for hateful comments and even more tangential related rants just from the few shown. As you can see, hate and division fuels more hate and division. And this kind of interaction feeds a troll who wants attention. Now say you click into the page of the original creator. Even now this page posts roughly 12 times a day with content that is mainly divisive and could be classified as attention seeking at best and 'screaming hatred' at worst. It shows some instant signs that this person is a troll account that is fed off the attention they get from posting these horrible memes. These four signs are HUGE red flags that this person is a troll. 1. Their profile picture isn't their face. Almost all troll accounts use pictures that aren’t their actual face. It plays into the classic mentality that they are insecure individuals. Also, it is a bonus if the profile picture is something patriotic or religious. Sadly, having those kind of images for profile pictures makes people more trusting of the accounts. 2. Their cover photo shouldn't have a clear agenda. Who in their right mind would have a cover photo like this?!?! A troll. A troll would. No one needs to tell people how to behave unless they are using their account to solicit that kind of behavior in the first place. Also, the entire photo is a giant image of political propaganda and that is very common with troll accounts. 3. Why would a 'normal person' have so many followers? 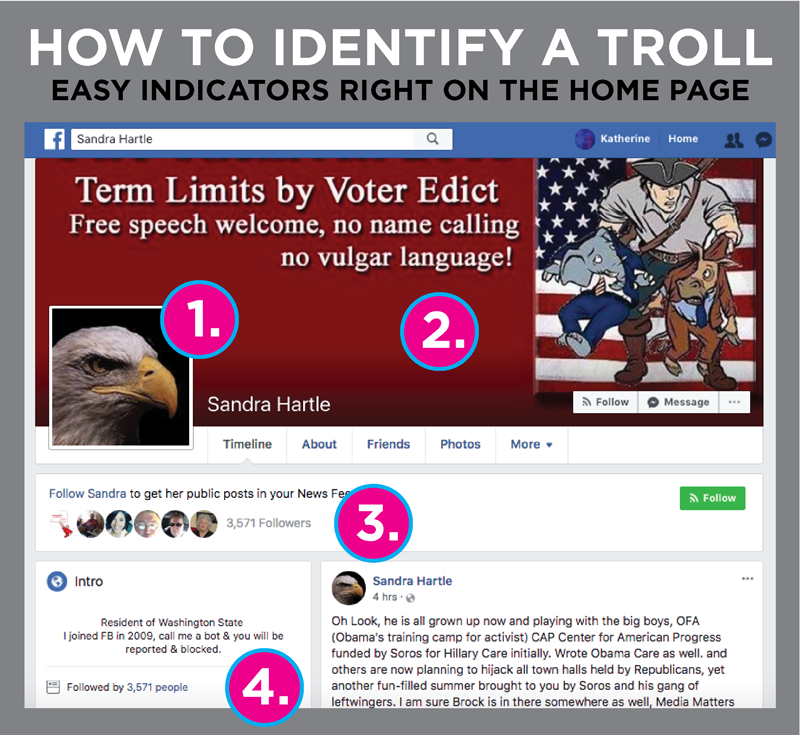 Trolls have moved past groups and political pages and they have learned that leveraging their personal pages for spreading hatred actually gets around many of the Facebook algorithms that are trying to stop the spread of fake news like this. Personal accounts are capped at 5,000 friends and when someone hits 5,000 friends people can still become a follower. Celebrities and people in the public eye can reach this number easily because of how many people they interact with, but trolls reach that number by turning their pages into a propaganda machine. They know what works and they do it again and again and again. They aren't on a crusade for a cause, they are on a crusade for a 'like' and a 'share.' You may think their content aligns with your beliefs, but they would change tomorrow if you stopped sharing it. They are doing the least amount of work they can, the more hateful the more viral! Just as they are addicted to the attention they get, followers are also addicted to the hateful content. It is a formula that works and they don't have to get creative or innovative for it to work. The followers love chiming in with even more hateful things to say. So hate breeds more hate. If you see an account of a 'regular person' has this many people following them, you should take time to think about that. 4. Why would anyone have disclaimer copy like this? It is because the amount of garbage this page pumps out to the internet is on par with a Russian bot. This page has no real thought of their own besides hatred and spreading it. The page is actually making a point to say they 'were on facebook since 2009' and claim they aren't a bot because their activity is right in line with that kind of internet garbage. Claiming they have been on the platform since 2009 is a way of getting past trolling and bot accusations. Thousands of these accounts sprung up in 2015 churning out this kind of stuff before the election. The fact that this page 'claims to be going longer' isn't actually evidence that they have been. When all else fails check the photos. When looking at similar accounts it may not be this obvious that they are trolls. But there is one for sure way to tell. Check their photos. Their photos will be full of gross memes and they will all be public and ready to spread. A troll's version of a family vacation album. So why does this matter? It matters because their are thousands of accounts like this on facebook posting thousands of these things everyday. And just one image got 20,000+ shares. JUST ONE! Just one had 20,000+ people fooled!!! Imagine how many people this account is fooling. This troll page posts 12+ times a day. The math on the amount of internet sewage these kind of accounts are pumping out is mind-blowing and we are the ones that are making it worthwhile for them. We are chiming in and spreading their images. Giving them the attention they so desperately want. We are feeding the trolls. We are spreading the hatred. And we are making the internet a worse place by doing it. As a graphic designer I have made memes and have been responsible for sharing them. But I believe I have a responsibility to make the world a better place with my work not a worse one. Creators have a choice of what they put out in the world and I want to shine a light on the propaganda that is being created. In the video below you can watch me scroll through this troll's page a little more in depth.